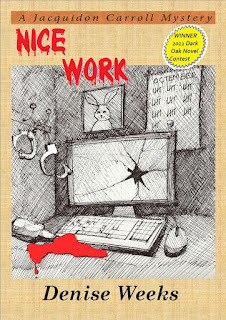 Denise Weeks, Mystery Author: WE HAVE A COVER! 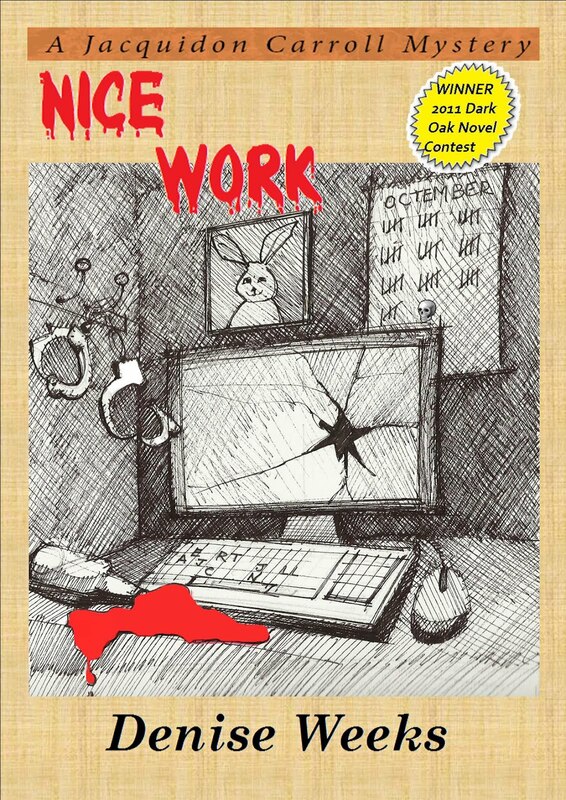 We have a cover for NICE WORK, the mystery that's coming out at the end of this month. The cover artist is none other than my cousin, Jay Cantrell. He is an artist and architect who has won major awards, including being sent to Paris and Rome to do sketches of the buildings. My husband and I did the cover graphics. We have a lot of control over how the book looks because of the wonderful publisher of Oak Tree Press, Billie Johnson. She has been magnificent to work with on this, all the way. Plus, she had the final say on which book won the contest! So I owe this all to her. Should have put her on the dedication page. Well, next time for sure. I will be having a launch party in Richardson (north Dallas area), one in Ft Worth (probably Hulen area or maybe downtown), and one in Sherman (Tx) where my cousin runs a restaurant. If you want an invitation to the launch party, just email me at shalanna@tx.rr.com and I'll get you on the list! There will be snacks and cake as well as talking and door prizes at each party! Also, I have put a fantasy novella online as a Kindle Short on Amazon. It will be FREE from Sunday, July 08, 2012, to Tuesday, July 10, 2012! This was written for Marion Zimmer Bradley's FANTASY magazine and/or anthologies, but Ms. Bradley passed away and the people who inherited the S&S anthologies eventually shut the magazine and then the books down and sent my story back some time ago. So this is BRAND NEW. It's a SHALANNA COLLINS story, unlike the novel, which is a DENISE WEEKS mystery, so the tone is completely different. It's a young adult fantasy sort of deal. Just so you know what you're getting for free! But you can judge somewhat whether you'll like my style in the novels or not, I think. If you have a Kindle or a Kindle app on one of your computers or pad-tablet type devices, you can get A WILL OF ITS OWN (about a magical dagger that dogs a poor little worker bee girl in medieval times) by Shalanna Collins from the Kindle Store absolutely free! Free from Sunday, July 08, 2012, to Tuesday, July 10, 2012--3 days!! I do so hope you take advantage of the offer and enjoy the tale. And feel free to ask questions about NICE WORK, my process, my path to publication, and so forth. Stay cool. It's raining in Richardson right now, in fact. Hallelujah! Watch for the book launch around the last week of this month!